Plasmaglow Firestorm scanning LED light bars are the mac-daddy of light bars. A cutting-edge and exceptional design will give your truck a specialized look. With its scanning feature, super bright LED's, simple mounting and multiple sizes this tailgate light bar is simply your best choice. 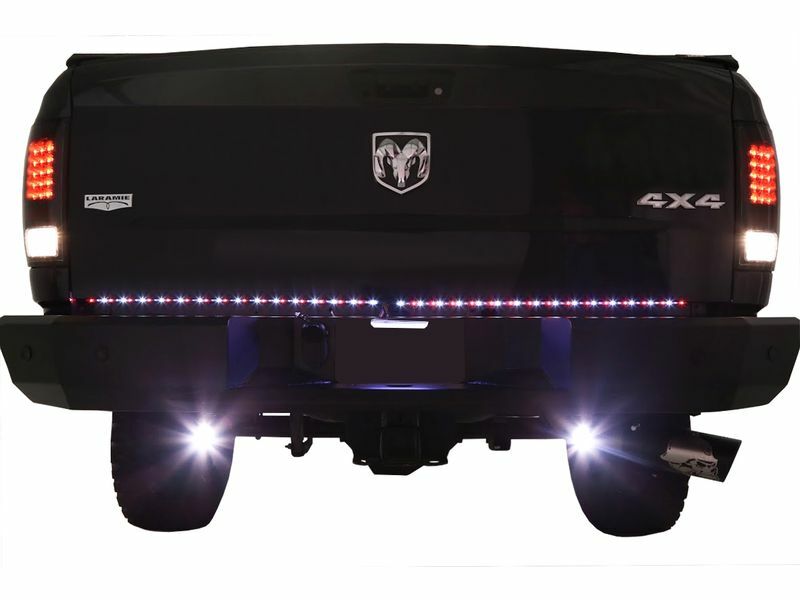 Red, white and amber scanning led tailgate lights give your ride a sweet look while enhancing your safety by offering more light on the road! The Firestorm has 5 different light functions that include red LEDs providing brake and running lights, white LEDs offering reverse lights, and a choice of red or amber LED's for scanning turn signals. Unlike other tailgate light bars that have standard blinking signals, the FireStorm tailgate light bar for trucks allows the signal light to "scan" from the middle of the vehicle to the edges. A bonus feature is the super bright LED's will vastly improve your vehicles visibility and safety. Aside from making your truck more visible, the FireStorm light bar enables drivers to clearly communicate their intentions when braking or turning. The white LED back up lights make driving in reverse much safer and easier. 3M self-adhesive pads offer a no drill, easy application under the tailgate so the light bar appears invisible. You will need to hardwire this scanning light bar to your truck; however the optional 4 pin converter will adapt it to fit your trailer harness. 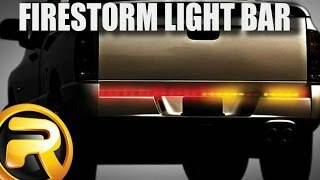 Plasmaglow Fire Storm LED tailgate light bar is a two piece design available in 36", 48", and 60" scanning light bars to fit nearly any pickup truck or SUV. If your brake light and turn signal share a bulb on your vehicle, you will need part #10999. Even if you do not purchase part #10999, you will still have to hard wire the reverse lights, as well as a constant power wire to the positive terminal on the battery. Please contact us with any questions you may have. The Firestorm Scanning LED Light Bar comes with a 1 year warranty that warrants the product to be free of defects in material and workmanship. This product offers an easy, at home no drill installation. The installation manual is clear cut and easy to read. For additional information, please see the installation manual below. You may also call us at 877-216-5446.